Beat the heat with this refreshing and healthy smoothie.Start your breakfast with this yummmmmm smoothie.Mango is rich source of vitamins especially vitamin B6.Bananas are rich source of potassium and they are fat and cholesterol free.This smoothie is very healthy for your kids as it will get your kids to eat fruits along with milk and curd.So made this yummy smoothie for your kids and also for your whole family. 1.Blend all the ingredients in a blender.Process until smooth. 2.Pour the blended mixture to a glass.Add ice cubes to it. 3.Smoothie is ready to serve. 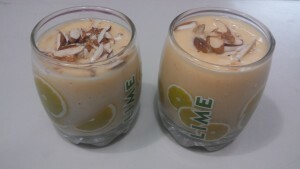 This entry was posted in Breakfast recipes, Kids special, Smoothies, Summer drinks and tagged banana recipe, Mango recipes. Bookmark the permalink.